Freemasonry is a brotherhood, sometimes referred to as a fraternity. Its membership is restricted to men. We are a group that exists to take good men and help them to become better men. Thus, it doesn’t take bad men and make them good.. It does not exist to reform criminals, nor would such persons benefit from its teachings. Variously known as Freemasonry, Masonry or The Craft, the beginnings of our fraternity are lost to history. Although Masonry is believed to be the oldest surviving fraternal organization in the world, the exact date of its founding is uncertain. Freemasonry can, however, be easily traced to sixteenth century Scotland although the first Masonic governing body was not founded until 1717 in London. The oldest Masonic document, the Regius poem, dates to around 1390 A.D. We know of no Masonry prior to that date. Somewhere between 1390 and 1717 lodges of operative masons began to accept as members men who did not work in the building trade. Eventually whole lodges composed of such persons arose, leading to a transition from lodges being composed of stone masons to lodges being composed of men from other occupations who gathered and shared a ritual replete with allusions to carpentry, architecture, and stone masonry. In 1717, four of these lodges in England met and formed the first Grand Lodge. A Grand Lodge is a Masonic body having jurisdiction over the lodges within a certain geographical area. Titles of Grand Lodges in the United States vary. Some Grand Lodges are called A. F. & A. M. which means Ancient Free and Accepted Masons. The most commonly used title, like that used in Arizona, is F. & A. M., or Free and Accepted Masons. Symbolic, Craft, or Blue Lodge Masonry has three degrees. The three degrees are, in order: Entered Apprentice, Fellow Craft, and Master Mason. You will find, should you become a mason that we have other related bodies such as the Shriners, Scottish Rite and York Rite. 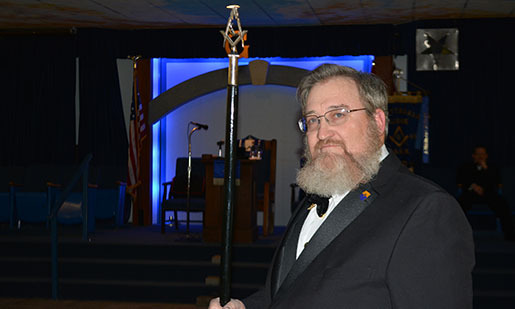 After you are accepted to the lodge, you will take part in several degrees. You can think of these as plays. The purpose of these dramas is to teach you several moral lessons. Beyond this, not much can be said as it is something you must experience. The three degrees have a biblical basis. Much biblical imagery is used in the ritual of the degrees. The central biblical image used in Masonic ritual is that of the building of King Solomon’s Temple, as meticulously described for us in the Old Testament books of I Kings and II Chronicles. Whenever a Masonic lodge is in session, the Holy Bible is open upon the lodge’s altar. Although we require that a member believe in supreme being, we never try to tell a man how he should conceive his supreme being, what faith he should practice or what worship he should follow. Those are questions of individual conscience, and the member must find those answers within his own faith. Masonry has for its foundation the great principles of the Fatherhood of God and the Brotherhood of Man. We are not a secret society! A secret society is generally one that wraps itself in a cloak of absolute secrecy. That means no one knows who the members are, where they meet, what they do or what they stand for. That is not Masonry at all! Masonry may have “secrets,” but it is not a secret society. Masonic secrets are few in number, and deal with the general method of initiation, the ways we recognize each other, and very little else. These parts of the ritual, which are called the esoteric side of Masonry, have been handed down by word of mouth for centuries. Masonry’s purposes, ideals, and principles may be learned by anyone who inquires. There are numerous books on these subjects which are available to the public. Masonry often has public notices in the newspapers, and our members are usually numbered among the more prominent citizens in the community. Masonry is large and diversified enough to provide what you are seeking. Masons are men who have joined together to improve themselves. This is accomplished through the principles and ceremonies of the fraternity. They endeavor to extend Masonic lessons into their daily lives in order to become positive influences in their homes, communities, nation and throughout the world. They base their efforts on morality, justice, charity, truth and the laws of God. 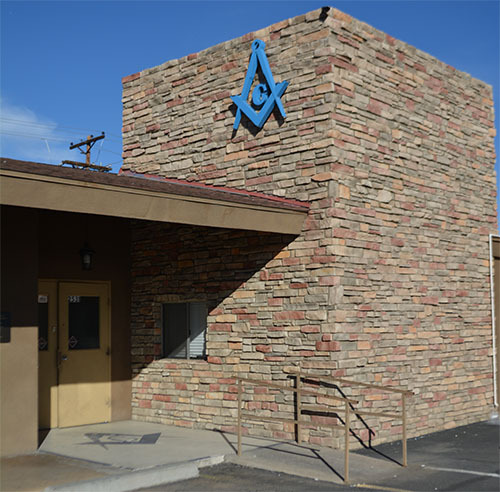 There are over 11,000 Masons in the State of Arizona. Worldwide, membership encompasses millions of men who believe and support the same fundamental principles. Joining the fraternity of Free and Accepted Masons requires that a man, of his own free will, petition a Masonic Lodge for the Degrees in Masonry. No Mason should ever ask you to join our fraternity. This is a choice that you and you alone must decide. Below are the general steps that a man seeking membership in Freemasonry may consider. Depending on the lodge, they will likely have their own procedures, just as we do, but this will help you get started and give you a better understanding of the process. Or you can click here to go to our address on google maps. If you know a Mason, ask him about the fraternity. Don’t be shy, we love talking to those interested in Masonry. In addition, feel free to contact our lodge for more information. If you don’t know a Mason, or even if you do, you can certainly come to our lodge and visit with us. Generally, this will be on a Thursday night, which is our lodges typical meeting night. Come on down and enjoy a great dinner and fellowship. We recommend that you contact our secretary to let us know you are coming. By doing this, we can have prepared information ready and available for you as well someone that can greet and speak with you. While lodge is in session, please stay and enjoy our “Friend of Friend” program. This is an excellent opportunity to sit and hear what Masonry is about and allow you ask any question you have. Request a petition from a Mason or from our lodge. Generally our secretary will be the one that will give this to you. You can also find a PDF version of the petition here. Your petition will require the signature of several Masons. If you don’t know any Masons, ask the lodge you’re petitioning for advice. Turn in your completed petition to our lodge. Ask if there are any fees that need to accompany the petition. Your petition will be received by the lodge and will be read during a stated meeting. It is highly recommended that you continue coming to lodge nights on Thursdays. This is our chance to get to know you better and for you to meet more of the brothers. It is also highly encouraged for new candidates to help out in the kitchen. You don’t have to, but it is a great way for everyone to get to know you. The Master of the lodge will assign three members of the lodge to interview you and investigate your background. The investigators may want to meet with you at home. There is a standard set of questions that all investigators must ask, but many will ask additional questions. Be honest with the investigators. No Mason is perfect…we don’t expect petitioners to be perfect, either. The most important thing here is to be true and honest. Your investigators will be given a deadline by which to return their completed investigation reports to the lodge. Their reports, along with their recommendation will be read to the lodge at our stated meeting. At this time, the Master of the lodge will usually call for a ballot to be taken on your petition. Eligible Masons will then vote on your petition and the outcome of the ballot will be announced to the lodge. Soon after the stated meeting, a member from the lodge should contact you with the outcome of the ballot and provide you with additional instructions. Good luck on your journey, it is truly a fantastic adventure.